The first rule of sports commentary is “Don’t react to the reaction” but I’m going to take a second to do just that. The Reds have had a rough start. The outfield can’t hit, the bullpen can’t pitch, and the team just can’t outscore the opposition. Many on Twitter have placed a good deal of blame right at David Bell’s feet. Blaming Bell is easy of course. Last season we blamed Bryan Price for the 3-15 start, and so did the Reds front office, who canned the manager. But Bell isn’t Price, I might remind you. He doesn’t have four prior seasons of losing baseball under his belt, and he has yet to field a team that remembers the point of the game is to have the bat make contact with the ball. I hope we can all agree that David Bell deserves a longer leash than nine games. A greater question then is: Do any of Bell’s decision so far signal a greater cause for concern? Has he over-managed? Does he deserve any of the blame? Managers, as visible and derisible as they are, really have little effect on a game. Tangibly, they can only do four things: Make the lineup, make pitching changes, pinch hit for players, and challenge calls. There’s intangibles too of course, but it’s far too early with far too few leaks from the clubhouse to know much about Bell’s intangibles. 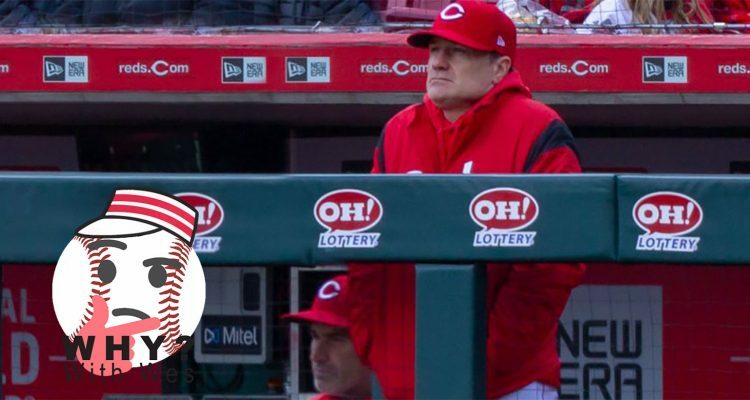 Ignoring challenge calls because losing one usually has little effect, David Bell has created nine lineups, made 60 in-game decisions, and gotten ejected exactly once in his tenure as the Cincinnati Reds’ in-game helmsman. First, we must acknowledge that not every player can play every day (April 6 was Eugenio Suarez’s off-day; April 7 Joey Votto’s). Second, we must also acknowledge that the lineup matters very little in the grand scheme of things. Yes, Joey should get more at bats than Tucker Barnhart, but whether Joey is ahead or behind Suarez will usually wash out over the long season. C. Trent Rosecrans optimized the Reds potential lineup by The Book, otherwise known as the sabermetric bible, for The Athletic in February. He included Scooter Gennett and Nick Senzel, so reapplying the exercise without those two seems prudent. Your best three hitters should hit No. 1, No. 2, and No. 4, The Book says, with the fourth and fifth best hitting No. 3 and No. 5. The leadoff man should get on base the most and the cleanup hitter should have the most power. At the bottom of the order, in the eighth or ninth spot, should be a second leadoff guy with some speed. And voila, that’s how the lineup should look. So how has Bell done so far? Perfectly by the book. All of these are composites consist of 2018 numbers weighted by who has appeared in what spot a certain number of times, and according to them, Bell has followed The Book’s advice to a T. The three best hitters by wRC+ hit first, second, and fourth, with the two highest OBPs in the one and two holes and the biggest bat in the cleanup spot. The fourth and fifth best hitters have hit in the third and fifth spot, respectively. And finally, the rest of the lineup rounds out in descending order by wRC+. Jose Iglesias, most commonly in the eight hole, also has the second fastest sprint speed behind six-hole hitter Jose Peraza. Yes, it’s fair to wonder why Bell preferenced Matt Kemp over Jesse Winker against righties in back-to-back days, but also Winker has gotten the lion’s share of time so far. Maybe the young outfielder was sick or just a bit lame after Opening Day. Who knows, but Bell’s lineups have been spot-on so far. In his eight games as the deciding force (Bell was ejected before any pitching changes were in the be made in the Reds most recent game), Bell has made 31 pitching changes. Of those, nine occurred after a pinch hitter came to the plate for the pitcher in the previous frame — unavoidable in other words. Another four came from the starter being pulled due to pitch count (Luis Castillo’s second start) or waning effectiveness (Sonny Gray’s first start). Bell then has made 18 pitching changes from choice, not necessity. Most are innocuous, clean innings. I would like to focus on two of the not-so-clean variety. With two outs and runners on first and second, David Bell pulled lefty Zach Duke in favor of righty Michael Lorenzen to face the Brewers eight-hole hitter Orlando Arcia. On the second pitch of the at-bat, Arcia hit a three-run homer that ultimately decided the game. Arcia, a righty, has hit .248/.287/.373 against righties in his career and .257/.326/.343 against lefties. Neither line is particularly good. Arcia has also hit 22 home runs off of righties compared to two home runs off of lefties in about a third of the at-bats. Apparently, Arcia generates more power against righties but sees the ball better from lefties. If you want to say Bell should have left in Duke after he had just struck out Yasmani Grandal swinging, I won’t blame you. Arcia does not have enough of a split to justify a reliever all unto his own. But the point of the matchup was never Orlando Arcia. If Lorenzen got Arcia out, end of inning, no sweat. If he didn’t and the Brewers wound up with bases loaded and their pitcher, Jhoulys Chacin, coming to plate, then Craig Counsell would have had to make a tough decision. Either pull his starter who was dealing for a pinch hitter, or leave him in to hit with two outs and the bases loaded in a tie game. The presumptive pinch hitter for Chacin would have been Ryan Braun, a righty who does have a large split against righties. Braun’s OPS against same-side pitchers falls 140 points, from 1.000 to .840. The Reds would obviously rather pitch to Arcia than Braun in any case, it just so happens they got burned. Obviously at the end of a tie game, David Bell should use his best reliever to give his offense a chance. But should he have sent him out for a third inning of work? The Reds had already used four relievers before Iglesias, leaving only David Hernandez, Wandy Peralta, and Robert Stephenson in the pen. Hernandez had pitched in the previous two games, so it was more likely to have been just Peralta and Stephenson. Would you rather another inning of your top pitcher who had only thrown 26 pitches at that point after five days of rest or trust Wandy Peralta and Robert Stephenson? It didn’t work out for Bell and the Reds, but I personally would much rather try Iglesias for a third inning before handing off to Stephenson than watch Peralta lose it in the 10th. David Bell has used 19 pinch hitters, four pinch runners, and made six defensive adjustments. Most all of these changes have been straight-forward, except for two. Twice, Bell has played the splits and pinch hit for Jesse Winker against Felipe Vazquez late in games. In both instances, the pinch hitter struck out swinging. Against lefties, Jesse Winker has hit .183 with a .595 OPS. Truly horrible numbers. And Felipe Vazquez is a special type of lefty with a fastball that touches 100 mph and a wipeout slider that careens across the plate. Jesse Winker’s first replacement, Kyle Farmer, has hit .235 against lefties with a .558 OPS. Not much better than Winker at all, and in fact, I would argue worse. Sadly, Farmer was the last man on the bench that day. Why Bell went with Farmer instead of just letting Jesse test his luck, I don’t understand. Winker’s second replacement, Curt Casali, does actually have success against lefties with a .826 OPS for his career. He just doesn’t have any success against Vazquez, now sporting a 1-4 career record with three strikeouts. Really, Bell has given all we’ve asked of him so far: Sensible lineups, aggressive bullpen management, numbers not names based decisions. 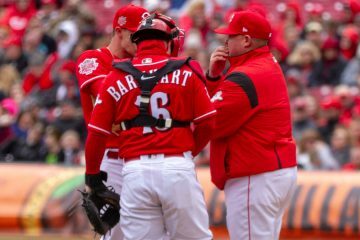 The Reds haven’t been good in 2019, but David Bell deserves the smallest morsel of blame much less the lion’s share. So let’s all calm down on Twitter and give him a shot to do better than 3-15 before we start calling for his head. Good outlay of the facts. I’m frustrated (as are the rest of us), but I’m not in panic mode. The hitters will hit … I’m hoping that happens tonight. This is on the players. Theyve had 3 different managers over the course of one year and the results are the same. Coaches garner too much praise when a team wins and too much blame when they dont. The only move Bell has made that I really haven’t been a fan of was removing Garrett on Opening Day for David Hernandez. Hernandez is quickly turning back into a pumpkin, and along with Hughes, is exhibit A on why you don’t sign pedestrian relief pitchers to multi year deals. Bell’s only real fault, to the extent he had anything to do with it, is simply roster construction. This roster makes no sense as currently constructed. To be honest, it would somehow makes MORE sense with Scooter injured than it would with Scooter healthy because Dietrich at least isn’t a redundancy. It’s not even that they have a lot of bad players, they just have pieces that do not fit. They insist on playing Matt Kemp for some reason, when it is so blatantly obvious he would rather be anywhere else in the world other than playing for the Cincinnati Reds (can’t say I totally blame him for that). They insist on Jesse Winker actually being a back up center-fielder despite being a below average corner OF. Kyle Farmer is a person that exists and is for some reason on the 25 man roster. It’s just a complete hodgepodge of blah and that’s how you end up 1-8. What does Kemp say or do that is so obvious? I’m not blaming Bell for any in-game decisions, but I also know this team did not come ready to play after spring training. The familiar malaise that has infected this organization for years. Agree. You expect little or pamper, and you get little. There are no consequences when players don’t care or play with passion. No wonder people got excited about Puig trying to fight anyone. At least one ballplayer has some vigor. Shout out to Chad Dotson and the rest of the Wahoo Nation! What an incredible tournament and season. At least it took my mind off of the abysmal Reds start for a few weeks. Good reporting, Wesley. As fans we are quick to blame the manager, I think Bell has done a good job and if his two questionable choices for pitching changes and one pinch hitter had worked out we would be ecstatic. If he had left Duke in against Milwaukee and Arcia gets a double, we would have been saying Bell should have put in Lorenzen, If he had… well you know what I’m saying=, “It is easy to second guess. Bell seems to be playing according to stats not a gut feeling. That feel better to me. There have been two other instances of Bell pulling a pitcher out earlier than they probably should have been. It may have only been an inning to early but I hate this thing where 3 times through the lineup, Can’t let them pitch business. Castillo and Disco both got pulled early and they were doing fine in their games. I don’t have the dates but I remember watching and was like why are they pulling them. I know managers like to try and score when someone is on base and the pitcher is coming up but you take a big risk on someone not pitching as well as the guy who is already in there. This team needs a better week desperately! We might be 10 games out by next Monday if they don’t win some games. I think later in the season you can have a gripe about pulling a pitcher who is cruising along, but just gets removed because of the 3rd time through the lineup data. However, in their first start or three, the pitchers are not fully built up yet, and so removing them at a lower pitch count makes sense. 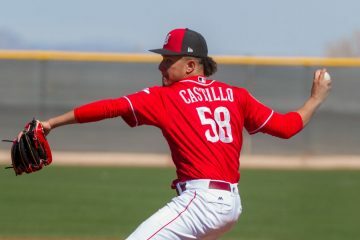 Additionally, in the case of the less mature Castillo, he needs confidence, and taking him out while he is cruising is good for his development in the short term. With Disco, he has not escaped early April without injury for the last three years, so caution is advised. As the year progresses, these reasons should diminish, and then we will see if early hooks are still justified. Why aren’t pitchers built up in ST any more? The Red Sox are suffering the same fate by limiting their pitchers in Spring Training. I want to nit-pick at one particular move. In Saturday’s game at Pitt, with the Reds Leading 4-3, the Pirates had runners on 2nd and 3rd, with their best hitter (Marte) at the plate. He let Lorenzen pitch to him….2 run double….lead gone. Never pitch to a team’s best player with 1st base open. Agreed. And Lorenzen has had the propensity to throw a set of excellent, hard-to-hit pitches followed by a badly missed meatball in the middle of the plate – I’m not sure why that is happening with him, but it cost the Reds the Milwaukee game (Arcia homer) and this one in Pittsburgh. thank you Wes. for me lineup construction and pitching changes are not what concern me about Bell. The question I have is, can Bell change the culture of losing and malaise we have seen over the past 5 plus years? we don’t have a true leader in the club house like a Scott Rolen or Barry Larkin so it will be up to the manager to get our reds to play spirited baseball again. so far the answer to this question is unknown. I have been to 2 games this year so far and haven’t watched any on tv yet. I went to the sunday 35 degree game shutout loss to the pirates. Bottom of the 8th Joey hits a high towering drive that bounces off the top of the cf wall and rolls towards left center. I am thinking my 92 mother could get a triple out of this and a major leaguer may at least entertain the thought of an inside the park hr. But no, I look up and there is Joey, strolling in to 2b with a stand up double. this is something that Bell has to correct if the reds will ever be competitive again. the second game was the brewers game where Lorenzen gave up the 3 run homer. the reds did make a spirited comeback and loved in the bottom of the 9th, our redlegs were actually standing in the dugout, rally caps on, cheering our hitters. haven’t seen that in a while. I just worry, the laid back player friendly mode of leadership Bell brings isn’t really what the reds need right now. Please explain to me why a mid 30’s individual with a propensity for Knee injuries, is expected to bust out a triple. Votto is naturally slow, as far as baseball players go. It’s not just that play. Reds had runners on 1st/2nd, with Votto on second and 1 out. Weakly hit ground ball to the shortstop, and Votto STOPS. The Pirates get the force at 2nd and Votto gets thrown out at 3rd. Instead of 1st/3rd two outs, the inning was over…Reds lose. It ends up being about 1 play per week, that Votto mucks up on the bases. Not because he’s slow, but pure mental mistakes. Then you were wrong the other time too. If he doesn’t stop, he makes it to 3rd without a throw. Has nothing to do with speed. In what world is he supposed to stop on a ground ball with a runner on 1st and 2nd? I don’t why the Joey Haters continue to harp on Joey about his base running, if he had busted a gut trying to go to third, or literally busted a hamstring), you would have complained that he shouldn’t have gone, you complain that he stopped between second and third but maybe he was trying to get them to throw to third and stay out of the double play. YES HE IS SLOW. Matthew Hendley is right he is thirty five and been through knee surgery. He may end up being the GOAT of the Reds. Let’s just enjoy what we have. Let’s complain about a guy getting over 20 million this year who weakly grounds to the SS. Wrong again, he runs his full speed towards third he is tagged out. He attempts to run around the third baseman and the 3B makes a movement towards him he is out of the baseline. Welsch explained part of that, common sense the other. Fair enough. But get back with us on April 22 to re-visit this premise. April 22 is an off day on a Monday. It comes immediately following a 9 game trip to Mexico and the west coast (STL, LAD, SD). A 2-7, or even a 1-8 road trip would put a much different perspective on your question. If the Reds only have 3 or 4 wins in the win column at the completion of this road trip Bell should be fired along with Turner Ward. … And they still do not catch the ball, throw to the correct base or run the bases correctly. Are the coaches coaching; or, are the players just bad fielders? I think the latter. This simply is a team with a dearth of talent. Maybe the front office stops the shenanigans with Senzel and bring him up. Perhaps one or two of the outfielders at AA are called up later this season and infuse some talent into this squad. Maybe the free agents to be are traded, bringing some close to major league talent to Cincinnati. Obviously, unless there are some sort of changes this is a sub-70 win team, again. I will be shocked if the Reds don’t win at least 70 games this year. Your prediction is, at least to me, not even remotely obvious. Momentum, as they say, is only as good as tomorrow’s starting pitcher. This team has much better starting pitching than last year, and a better offense (that I am confident will sooner or later start hitting). I won’t suggest you’re not entitled to that opinion, but I think you are over reacting. I disagree. They have alot of offense on this roster and the starting pitching should be a B or B-. The problem imo is that they put too much faith in Hughes & Hernandez from what they did last year. Lorenzen is a great kid, but he’s not a quality setup man. Iggy was off in spring training and isn’t 100% either. 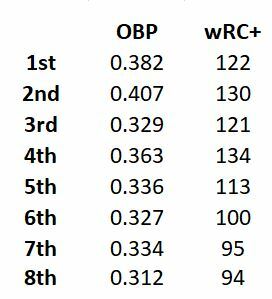 These good offenses are going to make your starter throw 90-100 pitchers by the 6th inning. Their pen is going to kill them? I think I’d try Bob Steve and Romano in high leverage along with Garrett. Might sound crazy, but I’d play Lorenzen in the OF everyday in Louisville. My iron-clad Number One Rule of Managing is simple. If a pitcher is effective, then leave him in the game. I understand that game circumstances may require a pinch hitter, but I go bats when a manager removes a very effective pitcher when he doesn’t have to do so. One good example was Mahle the other day. Bell pinch-hit for Mahle (at 78 pitches) with one out and a man on first in the top of the 7th. Fly out, ground out; inning over; Pirate score off the reliever and win. As much as everybody hates bunting, it was a viable option with Mahle. Get the runner to second, and hope Winker can single him in. Then, you avoid the inherent risk in whether the new pitcher will be effective, which is a very large inherent risk when the new pitcher is David Hernandez. Bell also botched not walking Josh Bell the other day. Modern managers tend to overthink things, usually caused by looking at the iPad instead of trusting his eyes. Josh Bell was dialed in that day. He was better that day than the charts would tell you. Anybody who watched Jay Bruce in a hot streak knows that there are times when you just don’t pitch to him. Bell’s errors are not his moves, but the moves he doesn’t make. On another note, they were going to eat $25 million of Homer Bailey’s salary. Why is it hard to decide to eat about $14 million of Matt Kemp’s salary? He is a bad fit on this roster; they should have traded him before spring training. Big Ed, I think there are lots of reasons why you might pull an effective pitcher, but they are largely special cases and I agree with the basic premise. You’d better have a pretty good reason to pull a pitcher who is dominant. Sometimes it feels like a manager’s quick hook in close games is just a way to eventually find that reliever who is bad enough on that day to lose the game. At times it’s incredibly frustrating. If it were me I’d love to see every reliever stretched out to throw 40 pitches (when rested) so you could leave them in for a couple of innings when they’re obviously dialed in. Old school I suppose but we can dream, right? I think Bell has been slow to recognize which relievers are his best. Duke was terrible last year, not good in spring training, but has been put in a few high-leverage situations. He continues to rely on Lorenzen and Hernandez in those situations as well. Neither are good. So far, Stephenson, Garrett, and even Wandy have looked the best. Garrett should be getting all high-leverage situations until the 8th or 9th when Iglesias comes in. I wouldn’t mind Stephenson either since he can strike people out. I still think it’s too early to tell. I’ve definitely liked his lineup construction and finding ways to get ABs for everyone on the current roster. I’ve also liked the fact that he’s used all his relievers so there isnt a situation like last year with Bob Steve pitching once in 10 days. Also, loved that he was willing to put Lorenzen in the outfield for 2 innings (assuming using his diverse ability isn’t a reason for his pitching struggles). I haven’t liked how quick he is to pull a pitcher. I understand what the data says about the 3rd time through the order, but I don’t think you can use that as an absolute. Also, he pulled Hughes after one batter the other night with a lefty coming up, but multiple righties after that lefty. So then he had to bring in Duke for the lefty, then another righty after him. I don’t think it’s sustainable using 3 pitchers in an inning that only one baserunner reached. I just think he plays the numbers too much as absolutes rather than odds and doesn’t use his eyes enough to determine the situation and if the odds fit that particular instance. I agree! Its way too early. Alot of things I like. Maybe he’ll try Lorenzen in the OF more often and give other guys a shot at the high leverage situations in the pen? Some little things I don’t like. Why post your lineup 6-7 hours before the game? Why give the other guys a chance to scout people or make a gameplan for the pitcher? Somehow Bill Belechik lists half his team as “probable” on the injury report and gets away with it. Why give more information (and time in this case) then you need to? I’m watching the Rays roll again. If Bell was smart he’d just do everything they do! Meadows from Pitt….1st rounder but just a platoon guy for them. They have to be the smartest team in MLB! Interesting stats on Comcast Chicago with the TB/White Sox game. I roll my eyes with some of the analytics today but this is interesting. Interesting that the guy was able to reinvent himself at 31 by suddenly getting more action on the ball. I have very little to say or even know about Bell. It’s the construction of the roster that the G.M. and especially Williams are responsible for. Has beens, mediocre pitching, not giving prospects a chance. I wouldn’t want to be drafted by the Reds. They are a stale team in attitude and talent. It’s disappointing. Poor fans. 9 games proves nothing, either way. I think Bell will become a good MLB manager. Bell is trying to win the games that the Reds actually have a chance to win which has been 7 of 9 games so far.I like it and this team will turn in around if the starters keep us in the game past the 5th which so far so good.I expect you will see more of Garret and Bob rather then Hughes and Hernandez as we go forward because they have swing and miss stuff and the older guys don’t.No complaints about Bell but as for the offense well its been terrible at best.